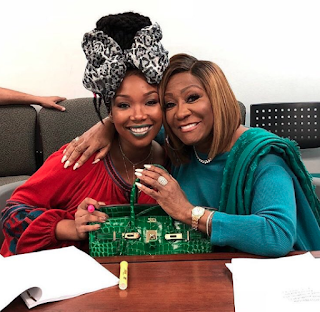 According to reports Brandy Norwood and Patti LaBelle have been cast on star as Queen Latifah's character's mother and younger sister. Lee Daniels teased Patti's appearance on Instagram. The show is trash and adding all types of stars will not help it any. I wish she would get her goddaughter Mariah and show her how to remain classy and dignified in that industry. Question: Is Brandy still fat or has she given birth yet? The placement of that bag is real sus. Maybe casting Patti and Brandy will help the ratings. I like this show better than Empire. I'm down for Patti. I would love to be at Patti's house on Thanksgiving. Mmmm mmmmm mmmm. But that Brandy... hell na! Every time she's on a tv cast the other actors end up dying. And she killed that lady in the car crash. She's bad news. @4:25...who from The Game died?